There is a wide variance in adoption of modern technologies available by field service organizations to streamline operational workflows. Many field service companies are still using manual ‘pen and paper’ approaches, while others are beginning to embrace all that technology has to offer in order to improve their business, cut costs, and increase customer satisfaction. 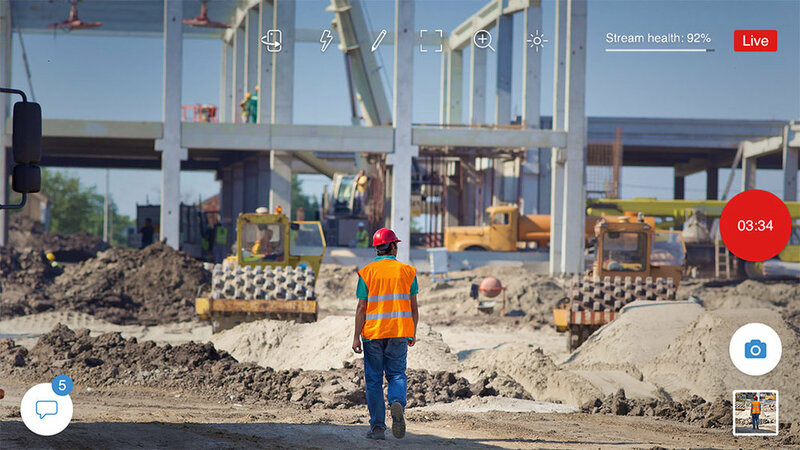 Document every project from start to finish using mobile live video. Capture, store and share videos and photos, categorizing the content in a centralized location for easy access at a later date. Provide your clients with step-by-step updates on your progress or finished work. Also, use the captured content as proof of compliance with all regulations and quality assurance protocols. Some mobile live video solutions even associate valuable metadata to the captured videos and photos. This can provide important information relating to the origin of the content. Mobile live video is an invaluable resource for solving complex problems on the spot through colleague collaboration. Field service employees can use mobile live video to communicate directly with senior technicians in the HQ’s control center, and together they can assess the situation, working together to find a resolution. This removes the need for requesting on-site support or even repeat call-outs. If an appropriate platform is available, customers can even self-serve through sharing mobile live videos of the issues they wish to resolve. This could eliminate the requirement for call-outs in general. Mobile live video is a mobile tool, so it goes where your technicians go. Being app-based, it means that your employees don’t have to worry about carrying around additional equipment when out in the field. Another major advantage is that it is easy to use. The training of any new process, equipment, or technology can be extensive, disruptive, and not to mention expensive. It will only be worth the investment if your staff find it easy to use, and it doesn’t add any additional time to their standard daily activities. Rolling out mobile live video in your organization can be as easy as installing an app on your employee’s smartphones. The Bambuser Broadcaster app can be rolled-out to your entire workforce in an instant, integrating seamlessly into your existing Field Service support apps or web-based platforms. Through using mobile live video as a tool, your organization will benefit from a number of efficiencies, some of which we have already mentioned above. These efficiencies will not only help your organization from an operational perspective but will contribute positively from a financial perspective too. Mobile live video reduces the cost of equipment as it is simply accessed through a standard smartphone. In addition, all content recorded by employees, depicting how complex problems are solved on-site, can be saved and stored in a communal repository for new and junior technicians to utilize. This dramatically reduces the cost of training and up-skilling your employee base. By reducing the number of call-outs required this positively impacts your business, from decreasing the number of vehicles in operation, to ultimately reduce the cost of manpower, thanks to a more streamlined and efficient organization. Mobile live video is quickly revolutionizing the field service industry, as it is across other industries. For organizations who have yet to invest in new field services technologies, like mobile live video, we would recommend that they dedicate some time to research the solution and its benefits in more detail. There are comprehensive turnkey applications available, which are ready to roll-out immediately, without the need for a development team dedicated to integrating and maintaining mobile live video. The best way to see how mobile live video benefits your organization is to try it out, check out Bambuser’s free trial and get started today!